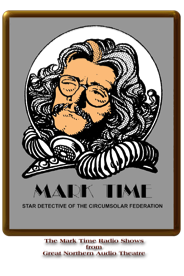 Ossman, a member of The Firesign Theatre and independent audio producer, actor and teacher, suggested to the others that the image of his radio character, “Mark Time,” (drawn by Bill Stout) could be used to salute the work of a new generation of writer/producers. Stearns, a long-time KFAI radio host, for many years a writer/producer of programs for the Minicon science-fiction conventions and an authority on SF audio, contributed his access to the Minicon stage and Twin Cities’ fandom in addition to writing and producing the event itself. Many thanks to GPS, the Geek Partnership Society for their many years of support and encouragement of the Awards, and for their other activities in celebration of geek life.